One of the biggest advantages of owning a new CPS demountable stage system is thanks to its flexibility and the way our decks have been designed allows them to adapt to most situations in a multitude of different venues. 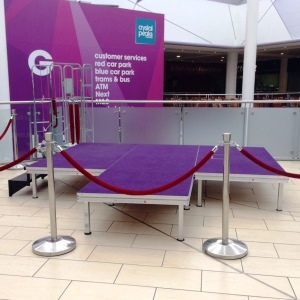 Our staging systems are also easy to put up and take down and can be found in many primary and secondary schools, churches and other religious buildings, village halls, shopping centres, hotels, conference rooms, museums, sports and leisure centres, golf clubs and many other entertainment and sporting venues. A CPS staging system is lighter, safer, sturdier and easier to move around and store than its predecessors ‘the old wooden blocks ‘. It also means that the room is available for greater use as the re-arrangement of space is something that anyone can handle in a matter of minutes. We also have two NBS+ specifications for our Alu Rapid and Alu Rapid Junior systems that can assist an architect with any projects that require a staging solution. These industry approved N10 specifications can be viewed here. Then there is something quite unique that really makes our staging different - our systems come with a lifetime warranty. If anything goes wrong or gets broken as a fault of our manufacturing, just let us know and we’ll replace it. If you’re unsure what staging system or configuration you need then we would be delighted to assist you and put some ideas on the table. We have over 50 years’ experience of working with a wide range of different organisations across the world and we have visited thousands of different venues throughout this time so we’re confident of getting it right for you! Our staging expert, Tim Gilson, would be more than happy to meet with you at your convenience and demonstrate our system to you and your colleagues. Please don’t hesitate to contact Tim If you would like to arrange a free demonstration or no obligation quote on 01302 741888 or email your requirements to us.